Now that we were finally at the first leg of our trip, it was time to start in earnest. Waking up at the Cave Creek Ranch was majestic – the magnificent peaks of the canyon walls reflecting the morning sunlight was beautiful, there were a multitude of birds hanging put at the feeders just outside the back door: curve-billed thrashers, canyon towhees, cardinals and several hummer species, along with cliff chipmunks and rock squirrels. After a nice breakfast of pancakes, we headed out to check out Dave Jasper’s “Big Thicket” outside of Portal. The space is basically a clearing amidst a bunch of brush, lined with different feeders and some local plants, with a few benches and chairs set up for visitors to rest on while looking at the many birds which partake. 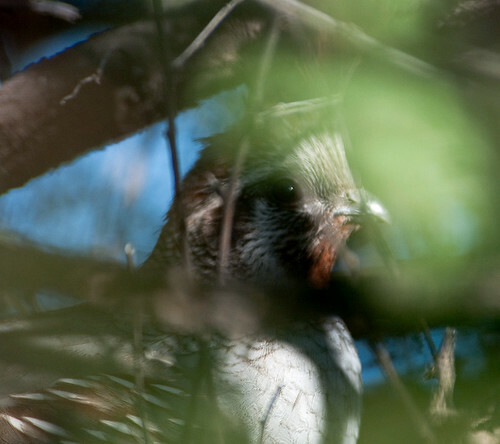 Our first sightings actually occurred outside of the thicket proper, where I saw my first new butterfly (a marine blue*), and we got to see a rare Gambel’s x Scaled Quail hybrid* hiding in some brush. I heard an odd call that got my attention, but Shari actually found the bird. I got one very obscured photo (see below) but it shows some of the field marks clearly enough for ID. Our next stop was the famed South Fork of Cave Creek Canyon, best known for its reliable Elegant Trogons. We didn’t get to see those (it was probably a little late for them at that point), but there were a ton of other delights for us. There were a few different species of Empidonax flycatchers, but more exciting (to me) was to see my first black-throated gray warbler* and painted redstart* along the road, where we were surrounded by beautiful red rock cliffs of the canyon, with the deep crevices and caves adding to the mystique of the place. The best birding occurred right at the bridge about halfway up the road to the trailhead. While we were there, there was an assortment of beautiful birds singing everywhere, filling this little area with birdsong. More Empidonax flycatchers were flying around the creek (one of there few places we would be that had strong running water), along with some hummingbirds, orioles and more than a couple Acorn Woodpeckers. Then came a song that was bigger than anything I’d heard to that point. 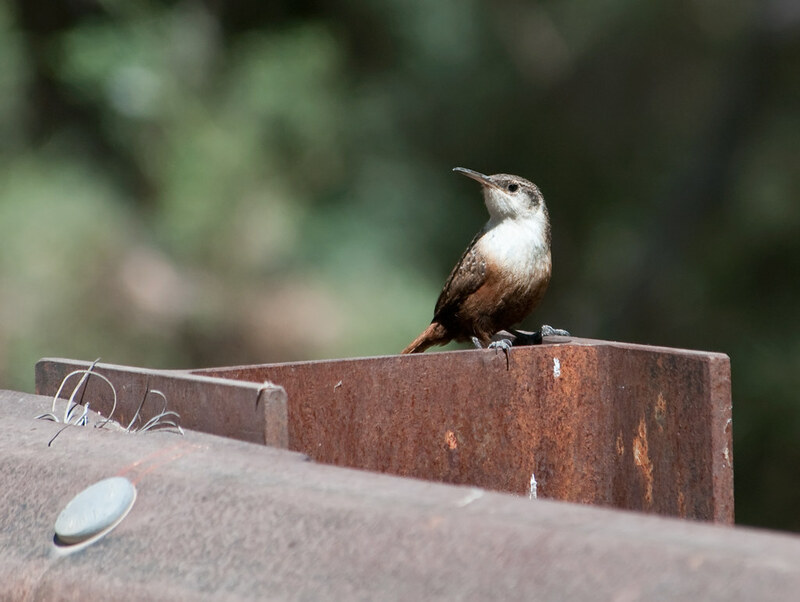 I was trying to locate it when Shari pointed it out that it was about 10′ closer than I was looking – in fact, about only 6′ away from me: a Canyon Wren* singing his little heart out. That song is definitely one you’ll remember once you’ve heard it. 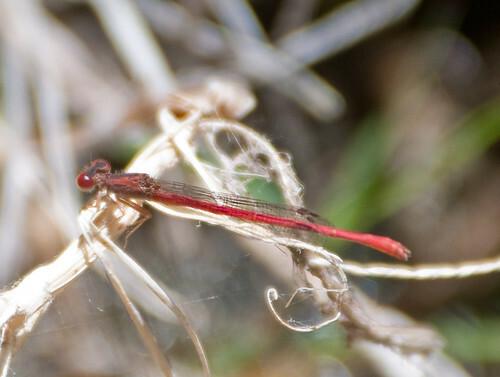 I also got my first odonata for the trip – a Red Rock Skimmer* which was patrolling the creek bed and sat perched for quite a few pictures. All in all, we spent at least an hour there trying to absorb all that was going on while sharing sightings, anecdotes and conversation with several other birders who came through. In fact, almost all of the birders we talked to during our trip were extremely friendly and helpful. Great people, those birders. After our time here, we went back for lunch then headed back up the Cave Creek road to the Southwestern Research Station, where rarer species are sometimes seen. We were there at about the worst light, and the only birds who were active were a number of different hummingbirds: dozens of black-chinned, broad-tailed and blue-throated hummers whizzing back and forth between a half dozen feeders. 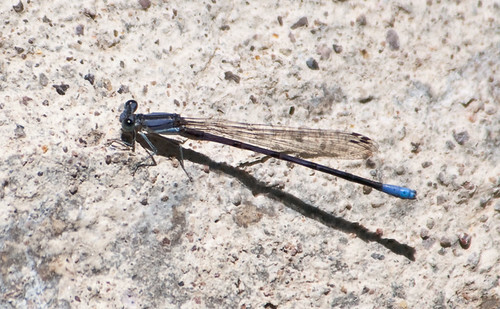 There were also a couple of new damselflies sitting by a water outlet near the bench for the hummingbird feeders: Springwater Dancer and Desert Firetail. 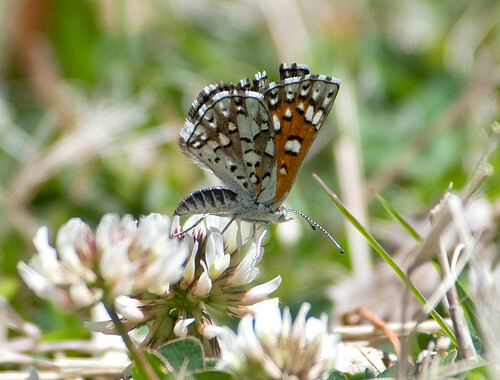 But what caught my attention most was a number of small butterflies gathering in a small area of clover near one of the feeders. I couldn’t ID any of them at the time, but it turned out that there were SIX species of small butterflies and skippers in that 10 sq. 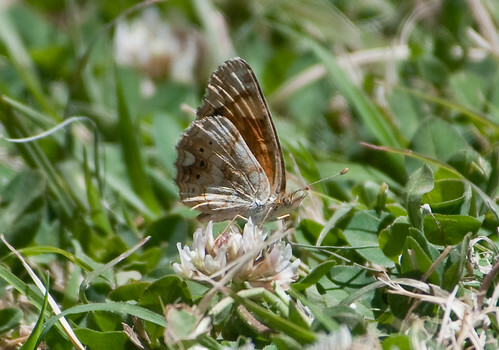 ft. area: Common Checked Skipper, Myletta Crescent*, Acmon Blue*, Reakirt’s Blue*, Desert Checkered Skipper* and Mormon Metalmark*. Coming back to sit with Shari, I was offered another treat, as a California Sister landed right in front of us – talk about a beautiful butterfly! After a visit to the SWRS, we decided to head up into the high mountains. The drive up to Onion Saddle (which led to our two destinations: Rustler Park and Barfoot Park) was beautiful, if a bit harrowing. A mostly one-lane gravel road full of hairpin turns, it also had amazing views and breath-taking scenes the whole way up. After many twists and turns, we finally reached Rustler Park. The main part of the park was somewhat slow birding-wise, although it was nice to enjoy the high altitude (and Shari got a nice nap on the picnic table). But a second stop at the spring on the way out proved more fruitful: we quickly saw Yellow-eyed Junco*, Lincoln’s Sparrow, Red-naped Sapsucker* and Hairy Woodpecker. 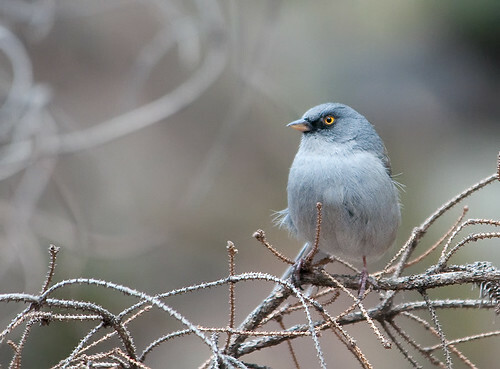 A little later we were greeted by a huge flock of Audubon’s Warblers, who all came in to bathe in the spring. 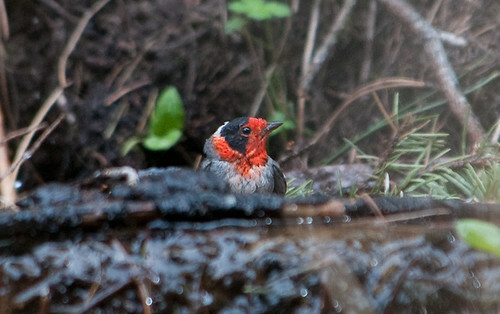 I hunkered down to get some pictures, when suddenly a flash odd red appeared in my view: Red-faced Warbler*! I didn’t get any good shots, but I got to watch it for a while as it bathed. Then it was time to head to Barfoot Park. It was another very rough mile-long road to the parking area, but it did give us Orange-crowned* and Olive Warblers* in the trees on the way. There was little else there and we were both getting tired so we decided to pack it in. We were heading back down the mountain (another dirt road of switchbacks), when I saw some movement in some bushes by the side of the road. Quickly scanning the brush turned up Ruby-crowned Kinglets, Orange-crowned Warblers* … and Mexican Chickadees*! We got back to the ranch with a good bit of light, so we checked out the feeders at Cave Creek. 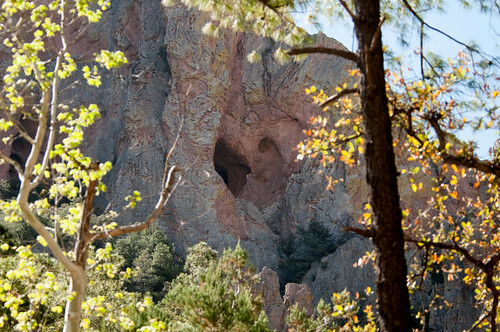 There was nothing new but we had a good time seeing those amazing hummers, Juniper Titmice and numerous woodpeckers. After our long day, we decided someone else should make dinner, and we knew we needed to get gas, so we asked about getting food in the town of Rodeo, where the only gas in the area was found. We were told, “Well it’s Thursday, so that means it’s pizza night at the Rodeo Tavern.” No, not a pizza special, but pizza was the ONLY thing on the menu. Well, upon getting to Rodeo, we found that the gas station was closed (some weird time-zone thing), and the bar didn’t seem like our style. So we opted for the Portal Store instead, which was a good choice: good food, lots of birders and a line on seeing an Elf Owl. All in all, a great day of birding and scenery, tackling three or four biomes, over 3,000 feet of elevation change (well, 6,000 if you include up AND down), 7 different locations and about 30 miles of driving on switchbacked, gravel roads. And for that, we got to see 53 species of birds (17 new), 6 butterflies and 3 odonates. Not too shabby!